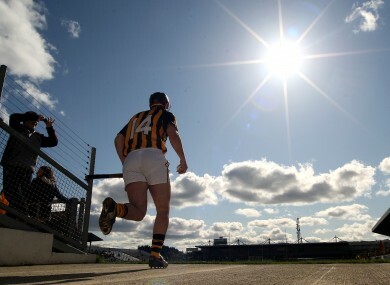 Eoin Larkin steps out into the sun. EOIN LARKIN HAS encouraged Kilkenny’s fringe players to play themselves into contention for the championship if they get a chance in tomorrow afternoon’s Division 1A semi-final. The Cats take on Division 1B table-toppers Clare in the first part of a Semple Stadium double-header, but do so without a handful of their star names who are missing through injury. Henry Shefflin (shoulder) and Richie Hogan (ribs and lung) have both set the Leinster Championship semi-final on 23 June as the likely target for their comebacks, while corner-back Jackie Tyrrell (ankle) returned to training earlier this week. Between them the trio have racked up 10 National League titles, but even in their absence, Larkin feels that Kilkenny have the squad depth to make their way back to another Division 1A decider. “As Brian often says, one person’s misfortune is another person’s gain,” the James Stephens clubman tells TheScore.ie. It’s a bit unfortunate for the lads who get injured, but that’s an opportunity for a few lads to stake their claim and a few lads have done that. Competition for places is always healthy and something we welcome in Kilkenny. Retirements too have hit Kilkenny hard this year. Since the All-Ireland success of last autumn, Eddie Brennan, Michael Kavanagh, John Dalton and James “Cha” Fitzpatrick have all hung up their hurls. The Cats’ underage structure might not be churning out young stars at the same staggering rate it once did, Larkin concedes, but there are still plenty of fresh faces ready to take the team forward. Injuries and retirements can only slow the Kilkenny juggernaut so much though. The simple fact is that Brian Cody’s men remain the team to beat. Under Davy Fitzgerald, Clare won five games from five in Division 1B to secure promotion and a place in the league semis. They too have their eyes on bigger and better summertime goals and Larkin expects them to come looking for the big scalp that will build momentum. Clare are a fantastic team so whether we finished first or second or third, it didn’t really matter once we got to the semis and got another match. The two games are going to be tough, there’s no doubt about it. They’ve a young team coming through and they’ve been building for a while. With Davy coming through, I think they’re going to be in with a great shout come Championship time. They’re where they want to be as well in a league semi-final and I think the two of us will be going hell for leather to get to a league final. Email “Larkin encourages Cats squad to pounce on opportunity”. Feedback on “Larkin encourages Cats squad to pounce on opportunity”.